This Summer People’s Palace Projects and Queen Mary, University of London are offering an exclusive free Drama Summer School opportunity specifically for 15 to 17 year old young people with experience of the care system. The project will be delivered by expert artists, facilitators, and directors, supported by QMUL Drama students, and will be a 5-day programme of training in Drama, culminating in a work-in-progress performance. The training will include workshops on verbatim theatre, devised theatre, multimedia, puppetry and a range of practice designed to enable participants to have fun, acquire new skills and explore career possibilities in the arts and creative sector. The Drama Summer School will take place between the 27th to 31st July 2015 on campus in QMUL’s Drama Department, which is ranked no. 1 in the UK for both research excellence and student satisfaction. The free course is open to 15 young people, and workshops will run daily from 10am to 6pm. It is a wonderful opportunity for young people to discuss issues that are important to them, share ideas in a supportive environment, develop leadership skills and find ways to share with others through drama. Over the five days of the project, participants will explore a range of drama skills to devise work that will be performed to an invited audience of friends, and professionals with an interest in the care system. People’s Palace Projects (PPP) is an arts and social justice research centre and charity based at QMUL The practical expertise required to deliver this project has been developed over five decades by Paul Heritage, Sylvan Baker and colleagues in the Drama Department, and more specifically through Sylvan Baker’s involvement as a practitioner/facilitator in Ben Cave Associates’ “Big Day Out” project for children in care on the Isle of Wight in 2005; a three year arts project with Wiltshire Virtual School as part of PPP’s practice-based research project ‘Favela to the World’; highly successful taster days for the Widening Participation and Outreach team; and a drama-based programme for young people in care in summer 2014 for GLA’s Peer Outreach Team (in liaison with QMUL Outreach), “What Does Love Look Like?”. Our referees for this work include Rebecca Palmer, GLA Education & Youth Team; Karen Reid, Wiltshire Virtual School Headteacher; and Simon Dear, Isle of White Government Children’s Services. Queen Mary University of London is one of the UK’s leading research-focused higher education institutions. With around 17,840 students, 4,000 staff and an annual turnover of £300m, we are one of the biggest University of London colleges. We teach and research across a wide range of subjects in the humanities, social sciences, law, medicine and dentistry, and science and engineering. Based in a creative and culturally diverse area of east London, we are the only London university able to offer a completely integrated residential campus, with a 2,000-bed award-winning student village at our Mile End home. Queen Mary has made a strategic commitment to the highest quality of research. We have invested in this principle by systematically recruiting the best academics in their disciplines from around the world. The results of the most recent national assessment of research – the Research Excellence Framework (REF 2014) – have confirmed our place in the very top group of research-led universities in the UK. Overall we were ranked 9th in the UK among multi-faculty universities and 5th in the UK for the percentage of our 3* and 4* research outputs. 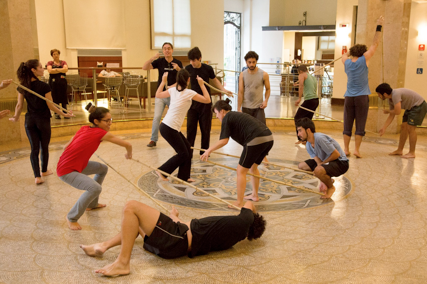 Drama practice generates space that offers methods of valuing individual contributions in an environment where creative energy can be harnessed and there is no wrong answer. Drama participation can build confidence, communication skills, focus & concentration as well as increasing young people’s self esteem, motivation and sense of personal capacity for achievement. Applied arts work offers a platform that can transform the way young people perceive themselves, and empower them to explore & creatively reflect on their choices, enhancing their belief in their own ability to forge new pathways. If you like to apply or know a young people who would like to join the Drama Summer School, please get in touch through renata.peppl@qmul.ac.uk. If you have any queries about the care + support structures, please ring: +44 (0) 2078825618.